In a series of 3 post I will look at the speeches delivered by Brian Lenihan, Mary Coughlan and Brian Cowen to their party ardfheis this weekend. Back in August 2008 and later in the annual edition of Business & Finance, I predicted exactly this outcome and timing for the tax increases announcement. The sad part, of course, is that were we to cut the waste choking our public sectors, we would have had no need to raise taxes. Once again, since late July 2008 I offered proposals that would have provided requisite and ample capital repairs to the banks while reducing the burden of this recession on the households. Brian Lenihan decided instead to sacrifice the financial security of private sector workers in order to appease his protected constituency around the Liberty Hall. There was one truth in what Mr Lenihan was telling his party: no matter how much he taxes the rich (aka anyone earning over €100,000), the tax impact of such measures will be minimal. Firstly, per Minister Lenihan, “two in every hundred people earn more than €200,000 a year, and they pay 28 per cent of all the taxes; while six in every hundred earn over €150,000, and they contribute 28 per cent of the total; while 6 per cent earn more than €100,000, and they pay nearly half of the Exchequer’s returns." Raising their tax bill by 10% will yield less than 3-4% of the current returns, or around €1.4bn. A chop change for Mr Lenihan’s public sector cronies. At the rate of spending to which our public sector became accustomed, the entire 10% tax hike would evaporate in 24 days! Secondly, any tax increases will lead to a wholesale tax optimization drive by anyone outside the PAYE system – and that covers the majority of the Lenihan's ‘rich’. Taking an assumption that some 3/5 of the 'rich' own their business or professional practice and they can reduce their tax exposure by a modest 20%, a draconian 10% hike in taxes will yield well below €1bn in added revenue. One should acknowledge the fact that after some 8 months of continuous failure to govern, Mr Lenihan finally offered a flaccid apology to his party (the country is still waiting for one, Brian): “if we could have foreseen the extent of the international crisis, we would have done things differently… There is little to be gained in beating ourselves up over this." But he reversed even this attempt at humility by charging the country for the deficit financing that he and his predecessor in DofF have pursued. Let's be honest, Minister, it was you and Brian Cowen who decided to award lavish wage increases to the public sector. The country did not ask for the wages of the ESB workers to be hiked to above €80,000 pa on average. Nor did it ask for e-voting machines, €250K+ contracts for consultants, pay rises for Ministers and senior civil servants, an army of paper pushers you've hired for HSE, billions wasted on white elphant projects around the country in attempts to buy votes in advance of each election, and so on. The blame for this mess is your Government's. "We have to get on and do what we can and do it in a united way.” Oh yes, Minister. United we stand: you with your aristocratic salary, drivers, cars, pensions and so on, your colleagues and immediate subordinates enjoying most of the same, and the people you are going to tax out of their homes, childcare and schooling money, the elderly whose meagre incomes you are going to butcher with higher VAT and other charges. 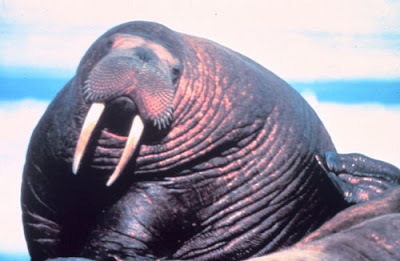 Spare us your whingeing, Brian – take a pay cut yourself! A 50% cut would restore your wages and pension in line with those in other advanced democracies. “We have an €18 billion hole in the public finances,” said our well-informed Minister. Actually, the hole is more like €21bn and that was before we add new unemployed to welfare rolls. NTMA admitted this much when it said last week that we will have to borrow up to €25bn in 2009. Where were you, Minister, when they made this announcement? “The world is looking on,” said the Minister. It no longer does. Last Friday the world sold some 90mln shares in BofI and AIB. The world holds no belief in you and your Government and neither does the country. Why? You did nothing to address the real crises for some 8 months since you took the reigns of the Exchequer in July 2008. Between July 2008 and today you've repeatedly insisted that your Government will implement at least €2bn in savings this year. Your Department has built this into the budgetary forecasts for 2009-2013. To date, you've deliverd a puny €1.1bn in savings. The world is no longer willing to be fooled by you! “We need to persuade those who might invest here that we are capable of taking the tough decisions now to get our house in order.” Too late to sob, Brian. The numbers of those who would consider investing in this country is now standing so dangerously close to nill that even companies with substantial capital already allocated to these shores are cutting their operations and laying off workers. After years of your and your colleagues waffle about 'competitiveness', 'productivity', 'education', 'knowledge economy' they have no trust in this Government. He went on: “We voted through the Bill that gives effect to levy that will see public servants pay on average 7.5 per cent to the cost of their pensions. …The public service pay bill accounts for one third of all expenditure”. So let’s do the maths. That 7.5% levy, net of tax deductions, is going to take only 1.5% of the total Exchequer expenditure or ca €700mln. But in July, September, October, December 2008, January and February 2009, you, the Minister, went on the record claiming the cuts will add up to €2bn on top of €440mln that you promised to save (and also did not deliver) in 2008! Our latest trade situation is dire (here). 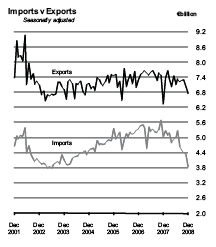 So the overall dynamic is that exports are now collapsing at a faster rate than the deterioration in imports. • Industrial Machinery by 15% and Metalliferous ores by 21%. • Petroleum products by 41%. There is little evidence in the aggregate numbers that Irish exporting companies are suffering from the Sterling devaluation: shipments of goods to Great Britain fell by 5%, while shipments to Switzerland decreased by 22%, the Netherlands by 16%, Germany by 10%, and the Philippines by 49%. Dollar devaluation is not biting either with shipments to the US up by 2%, although most of this is probably due to transfer pricing. Despite stronger Euro, imports of goods from Great Britain decreased by 7%, China by 18%, the United States by 6%, Japan by 28%, South Korea by 39% and within the Eurozone – from France by 13%, and Germany by 15%. Goods imports from Denmark increased by 50%, the Netherlands by 6%, Poland by 65%, Russia by 73% and Finland by 33%. The overall employment rate among persons aged 15-64 fell to 65.8% from 69.0% in Q4 2007 with current employment rate running at the level of H1 2004, effectively implying that the last 4.5 years worth of growth have gone up in smoke within a span of less than 1 year. There were 170,600 persons unemployed in Q4 2008 - an increase of 69,600 (+68.9%) in the year. The total number of persons in the labour force in the fourth quarter of 2008 was 2,222,700 – a decrease of 17,200 or 0.8% over the year. “This is the first annual decline in the size of the labour force since 1989,” says CSO. It is safe to assume that these figures do not include an outflow of foreign and domestic workers from Ireland. Overall, jobs destruction is thus much deeper than the QNHS figures imply. All age groups showed an increase in unemployment with those aged 25-44 showing the largest increase (+33,500). The latter effect is, of course, due to the idiotic labour laws that imply that for any company it is virtually impossible to lay off older workers. This, in turn, leads to a situation where the productivity of individual workers becomes irrelevant to the decision to lay them off or to keep them on a payroll. The long-term unemployment rate was 1.8% compared to a rate of 1.2% in Q4 2007. The standardized unemployment rate was 7.7% in Q4 2008, up from 6.4% in Q3. In a normal democracy, the Government would probably fall on figures like these, but whichever way you spin the figures – Mary Coughlan being the Minister in charge of both Trade and Employment should find some final remnants of grace and tender her resignation. Per CSO: “There were an estimated 476,100 non-Irish nationals aged 15 years and over in the State in the fourth quarter of 2008. Of these 349,300 were in the labour force, a decrease of 5,400 in the year to Q4 2008. An increase of 49,700 had been recorded in the year to Q4 2007. According to ILO criteria, 316,000 non-Irish nationals were in employment, a decrease of 18,700 over the year. A further 33,300 were unemployed, an increase of 13,300 in the year to Q4 2008. Nationals of the EU accession states showed a decline in employment of 16,800 and an increase in unemployment of 7,500 over the year. The unemployment rate for non-Irish nationals was 9.5% compared with an unemployment rate of 7.3% for Irish nationals. 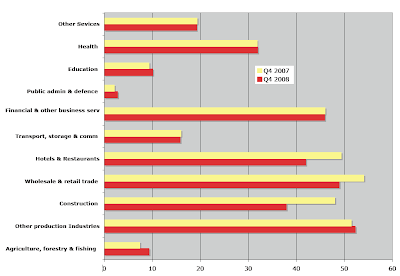 In the fourth quarter of 2008 non-Irish nationals accounted for over 15% of all persons aged 15 and over in employment. Over 34% of workers in Hotels and restaurants, 18.8% in Other production industries and 16.7% in Wholesale and retail trade sectors were non-Irish nationals. The largest decreases in employment for non-Irish nationals occurred in the Construction (-10,100), Hotels and restaurants (-7,400) and Wholesale and retail trade (-5,100) sectors.” Now, detailed tables in the release show that in fact virtually no foreigners were employed in the public sector (ex health and education) per chart below. Foreign nationals employment, 1,000s. So the total decline in foreing workers in mployment numbers of 86,900 was fully accounted, per CSO Table A1 as becoming either Unemployed (69,600), or out of the Labour Force (17,200), while 48,500 were Economically Inactive. Any idea how many actually left our shores? "Kranty" is a Russian slang for German "Kaput", Italian "Finita la Comedia", or in plain English "The end of the road". You get the wind... So is the latest 3-year Irish bond issue of €4bn at 170bp over mid-swaps the end of the road for Irish Exchequer borrowing? The FT's Alphaville blog seems rather pessimistic (here). FT's blog musings aside, for a country which has seen CDS levels in excess of those paid on the senior debt of an embattled English retailer just a couple of weeks ago, the question is no longer of the extent of markets pessimism, but of fiscal survival. And the latest bond offer is puzzling. Borrow short to lend long? First the 3-year term. It is equivalent to borrowing short to lend long, for even the DofF forecasts (rosy as they may be) imply that in 2012 - the bond will mature in the environment of a deficit of 4.75% of GDP and a General Gov Balance absent serial €16.5bn savings between now and then) of 12.25% of GDP. In other words, no one can seriously expect the Government to pay down the bond. So why is this 3-year term? Is it because the NTMA could not place any new bonds on these terms with a longer maturity? Is it because the market pricing for a new 5-year bond would have implied an admission of a junk-level risk on Irish Government debt? The indications that an answer to these questions might be, sadly, a 'Yes' is in the details of the bond offer itself. This time around we are raising only 2/3rds of the volume of funds raised in January's €6bn placement. Given that the Government, post January issue, was in the need to somehow raise ca €19bn of new funds to plug its deficit this year alone, €4bn today is peanuts. Why not go to the markets early and raise, say €10bn? We know we'll have to do this at some time later in the year, by when many other countries would have gone to the markets and the spreads would have widened for all, including the Germans? In short, a miniscule placement today also suggests that quite possibly, NTMA could not place a sizable issue into the market. Lastly, there are questions about the pricing of the bond. The FT blog outlines this problem perfectly: the latest bond "spread is almost five-times that of Barclays’ UK guaranteed 3-yr £3bn deal this week, which priced at 35bp over mid-swaps and Roche’s huge €5.25bn 4-yr deal at 225bp over". Yes, it is pricey, but it is not priced to sell. What is even more dodgy is that the NTMA claimed that the bond was over-subscribed to the tune of €1.2bn over the placed €4bn amount. In other words, the NTMA decided not to take more money today under the present bond issue despite knowing that it will have to tap markets for much more than that in the near future (here). Why? I have nagging suspicion - and this is speculative at this moment in time - that the bonds were issued to be placed primarily with the banks who can now roll them over to the ECB's lending window. Clearly, as a test case for the future, such a 'roll-over' had to be modest enough for the ECB (or other European states) not to smell a rat. Hence the €4bn ceiling. ECB's blind eye to Ireland? From ECB's point of view, this might fly for only a short period of time. Here is why. The ECB is fully aware that the Irish Exchequer is bound to come knocking at its doors sooner, rather later. Yet, a publicly open and transparent loan from the ECB would have to carry serious policy prescriptions with it that would be matching those impose by the IMF on other countries: a 15-25% pay cut for the public sector, a 10-15% contraction in public expenditure across the board, a reform of public sector pensions and a significant divestment by the state out of its industrial shareholdings. These policies - necessary to keep cool other would be borrowers from ECB - will cost Brian-Brian-Mary their jobs and can potentially derail the Lisbon II ratification. Hell, they might spell the end to the Euro itself, as a transparent rescue loan to Ireland will be followed by the demands for the similar lending from Italy, Greece, Spain, Portugal and possibly Austria. So the ECB is absolutely desperately trying to find some face-saving formula to allow Ireland access to funds without opening the door for other Eurozone states and without imposing punishing conditions on our incompetent Government and overweight public sector. Hmmmm... has anyone gave it a thought how are we going to squeeze out the remaining €15bn without anyone noticing, then? It is now being rumored (hat tip to BL) that the NTMA was originally in the market for placing €6bn worth of bonds, got interest in €5.2bn, but due to extremely low offers (high yields) was forced to claw the issue back to €4bn. It correct, this implies that we have issued a bond with subscription rate of only 67% - by any reasonable measure constituting a failure by the state to finance less than 1/4 of its annual budgetary requirement. In other words - a failure of borrowing on a 3-year basis. Things can't get much more embarrassing than this, folks. And yet, to this moment, I have not seen a single media article, actually recognizing this reality. Is our media going 'soft'? or have we, engulfed in a rediculous charade of the Anglo Irish Banks scandals forgot about the reality of having to tap the markets for at least €15bn more in cash, having in effect failed to raise the mere €6bn last night?.. "Outflows of funds from Ireland in recent weeks have not reached a critical level despite market stresses, Finance Minister Brian Lenihan said on Tuesday. 'There has been stresses in the markets in recent weeks,' Lenihan said. 'There has been some outflow of funds -- it has not reached a critical level,' he told public broadcaster RTE, declining to give further details. Lenihan told Reuters in a separate interview that Ireland's financial system has been under major stress since the state nationalised Anglo Irish Bank in January, but the country's other lenders were not afflicted by the same sort of corporate governance issues." This should have alerted both the Financial Regulator and the Government to the issue at hand. In fact, it was the CBFSAI that banned short-selling and conducted an 'investigation' into short traders dealing in Anglo Irish shares. Doing so, the Government has in effect caused the fire-sale closure of Sean Quinn's CFD positions and necessitated a loan-for-shares deal. Mr Lenihan's own department last week confirmed the story that some €10bn in 'funds or deposits' moved out of Ireland in one week - if such a flight not catastrophic, what is? The list can go on and on, but the core of this is pretty clear: Brian, Brian and Mary either knew all or most of this or are guilty of gross incompetence or both. Take your pick. My personal belief is that Brian Cowen is largely informed about the state of affairs, but remain politicaly partisan and unwilling to make any coherent policy decisions. Minister Lenihan is an unfortunate party to Mr Cowen's inability to act. When it comes to Ms Coughlan - she is simply not fit for the job. But none of this excuses the state of affairs at the helm of Ireland Inc. Either way, if heads were to roll, we should start from the top of the Government and then move onto CBFSAI and DofF. Enough covering up this charade - the buck stops somewhere and the rotten leadership is the best place for it to rest! Per Irish Life & Permanent post last week - the predictions of the market downgrades for IL&P have materialised and by now are starting to be exhausted (barring any adverse news). 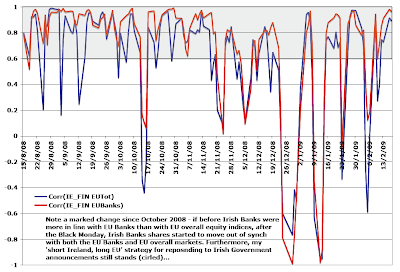 IL&P is now likely to slide toward a general downgrade trend that has plagued the rest of the Irish banking sector. Here are the updated charts reflecting the call I've made on IL&P last week. Chart below shows that IL&P is still being pulled away from the rest of the banks, with the share price collapse being much more pronounced. The support for this momentum should be exhausted sooner rather than later, given a hefty sell volume hitting the market. 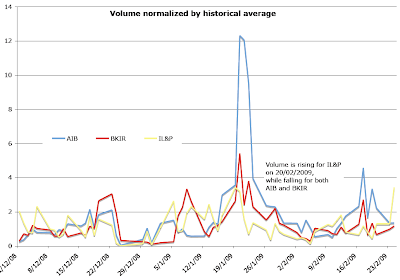 Chart above shows volumes relative to historic average, with current standing for IL&P sell-off at the local maximum. 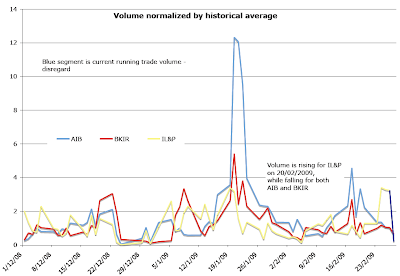 Again, in my view, this suggests some easing in volumes in days to come. 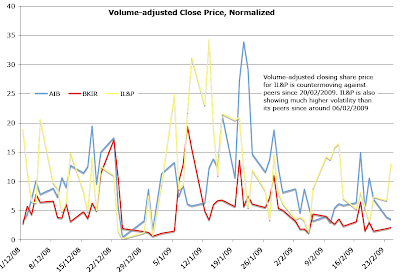 Chart below shows pure closing price (unadjusted for volume traded), with IL&P's nosedive being steeper than that for other banks. There is some room to travel down the price trend, but the downgrade over the last 3 trading days appears to me deep enough, so that, barring more adverse news, we should see settling of the share price into a gentler downward trend with wavering volume supports. 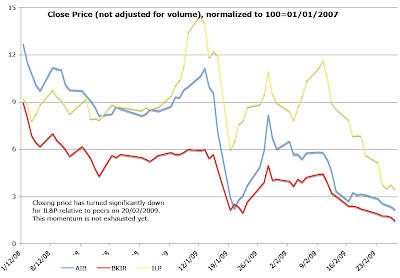 Finally, the chart below shows volume-adjusted sell-off of IL&P shares in line with the above charts. Brian Lucey of TCD B-school was last night stressing the issues of the IL&P's uncertain balance sheet and the overall position of the bank in the greater scheme of financial services in Ireland (see Vincent Brown's program recording), although, sadly, this issue was not picked up by either Vincent or other panelists. It is time we put Anglo's saga behind us and start looking at the rest of the sector. I am also starting to gradually shift into the unpopular view that while Anglo's own share support scheme (that €450mln loan-for-shares deal for the 'Golden Circle' investors) was wrong, ethically unsound and manipulative of the market, the 10 investors themselves (assuming the transaction was cleared by the Financial Regulator and other authorities) should not be scape-goated for their (stupid and financially ruinous) actions. Instead of disclosing their names, we should demand the disclosure of the names of all incompetent (or negligent - take your pick) employees of CBFSAI who were engaged in clearing the Anglo deal. To date, the blame for the entire affair has been placed solely on the shoulders of private investors who took losses under their own commitments (reportedly covering 30% of the loans total). Instead, it should rest on the shoulders of the Irish regulatory authorities and those in the Department of Finance who knew of the deal and approved it. They are the truly rotten part of the system! Per Financial Times report (here): CBs of Eastern Europe are issuing coordinated statements calling recent currency weakness unjustified and raising the possibility of intervention on foreign exchange markets. Take this, in line with George Soros' weekend cry to arms for state-led socialism to replace liberal financial markets regulation (as if such really does exist in any developed country today). Recall the classic lesson taught by Soros in the case of British experience with ERM: Central Banks interventions in Forex markets impoverish taxpayers and enrich George Soros. 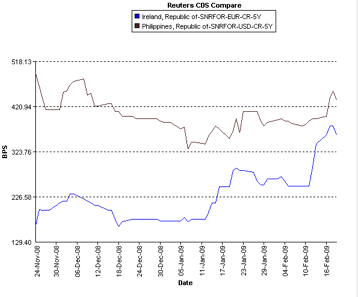 Scenario 1: CBs mount a spirited defense driving currency valuations up for ca 1 month before all currencies come down again on the back of excessive fiscal deficits, private economy contractions and implosions of housing bubbles (in some countries), with private banking continuous deterioration (in other). Foreign banks and domestic banks use the opportunity to aggressively expatriate capital at higher currency valuations, driving down demand for domestic paper. Shorting now is a 'win' proposition. Scenario 2: CBs do not mount a serious/credible defense and instead preside over further devaluation to bring currencies down to longer term recessionary equilibrium levels. Foreign banks, suffering their own crisis at home continue to expatriate capital, further contributing to devaluation pressures. Shorting now is a 'win' proposition. Scenario 3: George Soros gets his wish and EU-styled over-regulation reigns supreme over the Forex markets in which case we get stiffening of the ERM mechanism and a coordinated effort on behalf of the EU to drive down the Euro over a period of time. No Eastern European country would enter an ERM band at a peril to its exporters, so Poland (and potentially at a later date - Hungary, Romania and Czech) will devalue their currencies before the ERM accession to boost the chances of economic recovery. Shorting now is a 'win' proposition. Ireland government bond CDS at 3.4% and a recovery rate of 40-50% is equivalent to a risk-neutral (frictionless markets etc) default probability of CDS/(1-RR)=3.4%/0.6 = 5.67 pa or (1- (1-0.0567)^5)=25.3% cumulative default probability over 5 years. For 50% recovery rate, the latter figure is 29.7%. Now, investors are risk averse, not risk neutral, and the Irish bond market is not exactly frictionless which can push the above probabilities down, although we do not know by how much. What is, however, not accounted for here is the potential downside to the recovery rate - the amount that can be expected to be recovered should a sovereign actually default. For now, the markets price in a 40% recovery, implying that in the case of a default investors can expect to get 40c on each Euro back. But how realistic is this?
" Uncertainty about the expected recovery value is a main caveat when pricing credit-contingent claims in reduced-form models...The resulting recovery value estimated from Argentine global bonds starts out above 50% and falls to 25% after default." So back-track from the above to today's Ireland Inc scenario and, suppose the recovery rate of 60% today implies a recovery rate of 30-40% at default and the current probability of default over 5 years of (1-[100-CDS/(1-RR)/100]^5)=36%... Nothing to worry about, folks, then - in plain English the above means that if Ireland Inc is any better than Argentina (the country that routinely and with frightening regularity takes foreign investors to the cleaners), our CDS levels today might be consistent with an equilibrium cumulative default odds of over 1 chance in 3. But hold on, if the CDS rates are not a decent measure of implied default probability and a purely speculative tool instead (as our Nobel-prize contesting gurus from Davy, the DofF and CB keep telling us), why should the CDS data track closely the yield spreads? Maybe because they 'kinda feel so, man!' or maybe because the speculators in both markets are all in some global conspiracy club (wearing Venitian Canvivale masks and speaking in secret signs), or maybe, just maybe, both markets are really not buying the DofF-led and Davy-repeated story of 'no risk of default for Ireland Inc'. Either both, the markets for CDS and Irish bonds are wrong, or Davy and the Government are. Take your pick. "Irish Life & Permanent (IL&P) and Anglo Irish Bank could be facing fines of €5m each if the Financial Regulator determines the two banks engaged in market abuse by executing €8.2bn in circular transactions to make Anglo's customer deposit base appear more robust. ...which it has called 'completely unacceptable'." It might be not a smoking gun for IL&P's 'new' sins, but it should keep markets on its trail. "...banks will either have to demand significant equity from developers or renegotiate loan terms. Most loans were given on the basis of a loan to value ratio, meaning that if the sites are revalued downwards the developer has to come up with the difference. This is viewed as unrealistic. As a result, banks have again moved to avoid formal valuations and there are claims some are setting up special vehicles to move loans off their balance sheet so they can amortise them over time, rather than writing them down." is 'unrealistic' indeed. I have shown the Anglo Irish Bank's annual results as being clearly indicative of some of this engineering going on (see here). And, since the beginning of 2008, virtually every developer plc has 'renegotiated' its loans covenants. Does anyone seriously believe that the rest of the banks posse is somehow above this Anglo practice? Ireland is inching closer and closer to the 'Bad Bank' solution that should have been enacted some months ago. At the very least, to repair the repairable - household loans and mortgages - thus providing more room for addressing the developers loans. The difference today is that we are out of cash to get such a bank going, thanks to a rushed re-capitalization and the Government's unwillingness to extract real value out of public sector waste. And private money is already smelling the roses (here): €10bn outflows out of Ireland in one week - some 5.6% of our GDP or 3.2% of all main banks deposits gone in smoke. What is the downside to the Exchequer on this? Should the outflow continue unabated, within a week or two we will be facing the need for a new round of banks recapitalization, this time around - ca €10bn... and the money will come from?.. The minute the markets recognize this reality - Mr Lenihan with an empty policy gun and the bear still charging undeterred - things are going to get rough. All this week, while the politicians were preoccupied with Anglo's saga, I've been watching what appears to be the next downgrade target: IL&P. Intimately linked to the Anglo Irish Bank's shenanigans, IL&P has had a rough ride alongside its other free-standing (for now) peers: the AIB and BofI. Towards the end of this week, it seems, this term - 'alongside' - has become far less descriptive of IL&P's share price behavior. Are markets on to something we are yet to discover? I don't know, but here is how strange the things got in the course of last week. 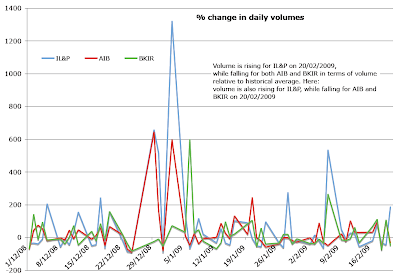 Chart above shows correlation between the daily volumes for IL&P shares and the average daily volumes of AIB and BofI shares since December 2008 through February 20 close. Clearly, things gotten a bit out of pattern ever since the local low -0.5 correlation was approached on February 16. 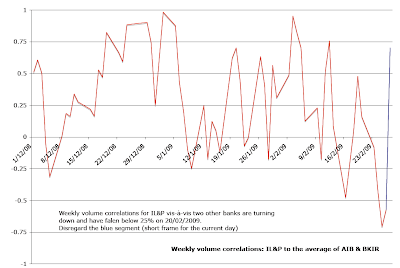 More importantly, Friday the 20th of February saw a reversion of correlation down to below 0.25. 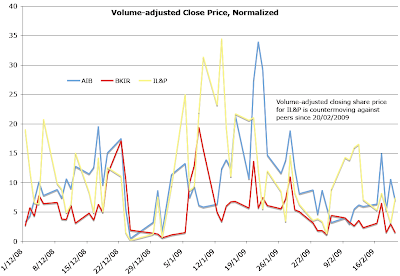 As illustrated in the following chart, this is not surprising, given that both AIB and BofI volumes declines on Friday have been countered by a significant volume uptick in IL&P. Of course the volumes changes - especially pattern reversals over historical averages - are significant as they signal (in this case) a rising support to the general direction of share price movement. 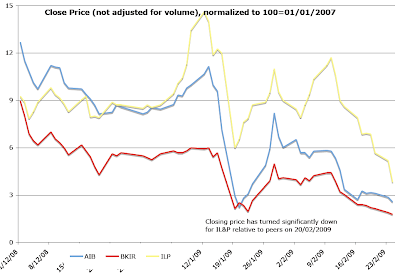 At this moment, the market appears rather committed to downgrading IL&P, while treating AIB and BofI much lighter. 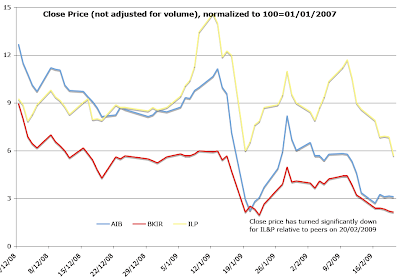 Of course, the chart above lends some support to my last hypothesis: while both AIB and BofI are seeing moderating decreases in prices alongside falling volumes, IL&P is seeing increasing downward pressure on price alongside increasing volumes (note the chart above plots the product of price to historic average ratio and volume to historic average ratio). 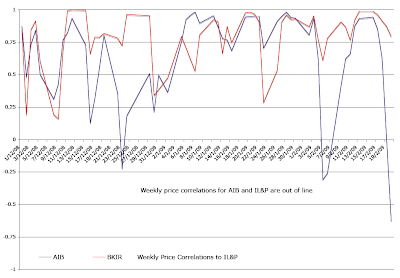 But don't take my word for this: chart below illustrates by referring directly to prices. all four are currently signaling some potentially new concerns about IL&P emerging in the market. Can it be the aftermath of the Anglo affair? Possible. But how likely is such a scenario given extensive downgrades to IL&P on the back Anglo's news in the past and given that by now the company has been devalued as if it were a pure banking sector play, effectively discounting the insurance side of business to nil (chart below). Can it be that the markets are becoming aware of some new set of skeletons in IL&P's closets? Also, possible. And, given the scandals surrounding Anglo, Irish Nationwide and other players, somewhat probable as well. The link to the most wanted publication - the Anglo's annual report for 2008. Let anyone reading this while posessing knowledge in corporate finance and balance sheet analysis (I have none) comment on this and any other findings relating to the report. roll-overs of loans, and so on. page 6: Ireland lending up from €37bn in 2007 to €42.8bn in 2008. Given lack of demand for new loans and tight credit finance, is a part of this growth due to the rollover of non-performing loans with interest charges absorbed into 'new' loans? The report says: "In keeping with the Bank’s relationship based banking model, lending activity during the year was targeted solely towards the Bank’s longstanding customer base." Should we read this as 'the long-term developers reclassifying and rolling over loans'? page 7: Impairment charge on the loan book went from 0.5% in 2007 to 1.31% in 2008. Again, no guidance on future impairment charges, but should we agree with my/analysts numbers produced in December (here), we are looking at 4-5.3% impairment on property-linked loans or 3.5-4.6% on loan book. Some distance to travel yet. page 70 §12: total provisions for impairment were up from €149mln in 2007 to €879mln in 2008. Again, applying this dynamic to the 2008 figures and projecting into 2009, expected impairment charge for 2009 should be around 5%. Even assuming away the counterparty risk under the investment securities impairment (which might be unlikely to remain as high in 2009 as in 2008), we have a consolidated projected loan impairment charge for 2009 of 5.1% - higher than my 4.6% moderate risk scenario forecast. page 74 §20: serious fall off in financial assets held, with a rise in unlisted financial assets - is this again showing some financial engineering on the existent loans side? Unlisted assets against customers' liabilities up over 10% y-o-y, listed - down by ca 60%... losing the 'house' while accumulating the 'rubble'? you get: AAA/AA total drops to €5,751mln from €6,742mln in 2008, while BBB and lower rises from €197mln to €579mln. 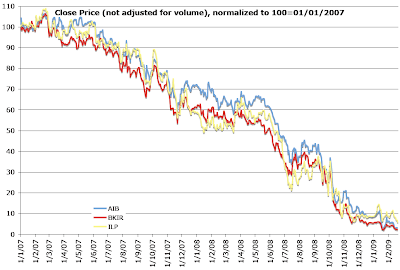 All sub-AA classed available-for-sale assets fall from €1,993mln in 2007 to €1,410mln per Report (despite the fact that the quality of may underlying asset classes has been deteriorating during 2008 worldwide, although, apparently not on Anglo's books), but rises to €2,212mln in 2008 terms under my assumptions. What is more plausible, folks? page 86 §25: Lower quality, but not past due nor impaired loans: up from €363mln in 2007 to €2,736mln in 2008, past due but not impaired: up from €1,621 in 2007 to €1,782mln in 2008, impaired up from €335mln in 2007 to €957mln. In the mean time, satisfactory quality loans amounts moved from €322ml in 2007 to €6,302mln in 2008. So in common parlance terms, Anglo's 'slury' loans creek has swell from ca €2,641mln in 2007 to €11,777mln in 2008, an increase of 359% - all in the year when impairement charge officially went up by only 162%. Now, taking 2008 impairment ratio at this rate of deterioration in the quality of loans implies 2009 impairment charge of 4.5% across the entire book (see the second bullet point above)... Hmmmm, someone is foolin here? pages 148-149 show loans to Directors and related parties. No new skeletons here - Sean Fitzpatrick is the only name on the list, with the rest of Directors names missing next to loans amounts. Anglo issued loans against its own shares as underlying collateral guarantee funds, and held no impairment provisions for Directors loans. Ah, I might as well stop at this point. Let anyone reading this while posessing knowledge in corporate finance and balance sheet analysis (I have none) comment on this and any other findings relating to the report. I am staying off Anglo case for now, having done more than our wonderous Minister for Finance, who could not be bothered to read the entire PWC report on banks he was generously recapitalizing with the taxpayers' money. We live in time of unprecedented crisis of confidence. Last week, carnage in the financial markets saw Irish shares sliding deeper into the red. Yesterday, for a brief period of time, our Government bonds were trading at the levels indicative of the markets pricing in a 22-25% probability of the state default on the loans – a level that would, in any functional democracy, see the Government facing a vote of no confidence. And yet, the circus of the private sector scandals alternating with policy debacles continues to repeat itself with a frightening regularity, undermining further international opinion of Ireland as a robust economy and a transparent democratic state. The reason for Ireland’s declining status amongst our peers is that by any measure, be it a measure of ethical and legal compliance in our financial sector or the benchmarks of transparency in governance, we are lingering at the lower end of the developed world league. Yesterday’s events surrounding the Joint Oireachtas Committee on Economic Regulatory Affairs illustrate the point. The Committee, set up by what in theory should be the most powerful legislative and policy entity in the country – the Dail – was exposed as largely toothless grouping of elected representatives. If the fact that the Committee has no powers to punish or prevent any wrongdoing by corporate and regulatory bodies operating in this country was not enough of an affront to public accountability, the fact that it has no capability to compel private individuals and public representatives to appear in front of the nation’s legislators certainly does the trick. At the core of this is the refusal by former Anglo-Irish Bank chief Sean Fitzpatrick to appear before the Joint Oireachtas Committee. But, before him, the same Committee heard an equally loud ‘No’ in response to an invitation to testify from Ernst&Young, Anglo’s auditors, the former Financial Regulator and the former FAS chairman. Despite being perfectly legal under the current system, Mr Fitzpatrick’s refusal to answer legislators’ questions concerning the alleged wrong doings at the now state-owned Anglo-Irish Bank is morally, ethically and economically disastrous for Ireland. From the moral perspective, Anglo-Irish Bank was taken over by the state at the expense to the taxpayers on the back of the managerial and strategic errors and alleged dubious practices. Mr Fitzpatrick was the Chairman in charge of this institution at the time of its failure. Mr Fitzpatrick – as both a Chairman and a private citizen – was also a party to several questionable transactions that allegedly precipitated the collapse of the Bank. Taxpayers are owed full disclosure of the events that led to the Anglo-Irish nationalization and Mr Fitzpatrick, alongside a number of public officials from the Financial Regulator and the Central Bank, must face open and transparent public questioning by the Dail. Of course, legally, the rights of all questioned should be respected, but compelling them to appear in front of the Joint Oireachtas Committee does not imperil such protection. From the ethical point of view, the democratic process must grant full respect and complete investigative powers to the Parliament. This simply means that the power of compulsion extended to the Courts must be matched by the similar powers available to the Parliament and its Committees. This is more than a theory – it is an act of establishing practical checks and balances to safeguard the interest of the people against the interest of the narrow groups and state institutions. In a functional democracy, Parliament must act as a guardian of the society, while courts must guard the rights of individuals. We are, clearly, getting that simple formula wrong, with our judiciary pontificating about social conditions in individual judgements and our Parliament incapable of even gathering investigative information. This Parliamentary investigative function has been imperilled many times before, including in recent months by the former Financial Regulator Patrick Neary and former FAS chairman Rody Molloy, who was forced to attend only by the wave of popular outrage over the FAS mis-spending of taxpayers’ funds. Mr Fitzpatrick’s move this week simply adds to this list of public figures who are allowed by law to ignore this country’s main democratic institution. Then again, what is there to be said about individuals, when the Government itself is unwilling to disclose due diligence information on banks rescue to the Oireachtas? Lastly, robust and effective markets require robust and effective compliance with the letter and the democratic spirit of the law. Thus, existence of Irish economy itself is predicated on our ability to investigate suspected wrongdoings, publicly disclose relevant information and identify and punish those who breach the law. The investigative work of the Joint Oireachtas Committee is at the heart of this process. Moreover, it is central to the issues of how transparent and open our market makers (top corporate brass, regulators, politicians and others at the helm of Ireland Inc) are. Once again, Dail’s inability to compel Mr Fitzpatrick to testify in front of elected legislators on the issues relating to the Anglo-Irish Bank’s nationalization is nothing less than a public admission of the fact that the Irish economy and society are not meeting the high standards of transparency that are required of the mature economies today. Last week, before Mr Fitzpatrick’s latest decision, one international investor, previously an active buyer of Irish shares, has told me that his fund is no longer willing to hold any shares in what he termed a ‘cosy cartel that is Ireland Inc’. The reason for such drastic re-assessment of the fund position was that his managers found it hard to believe the corporate and regulatory culture of Ireland in the environment where the Government refuses to openly discuss the issues of due diligence in the cases of state investments in the banks, the regulators who fail their basic functions are getting off with a golden handshake payoffs, and corporate leaders cannot be called to public account. Sadly, the events surrounding the Joint Oireachtas Committee on Economic Regulatory Affairs this week are proving him right. Yet, the pathetically inadequate power of the Joint Oireachtas Committee uncovers democratic deficit in our legislative and policy-making systems that is hardly new to anyone living in this country. For over two decades now, a group of unelected and unaccountable public and private sector representatives has presided over economic and social policies in this country. The name of this club is the Social Partnership. Its modus operandi was and remains clandestine negotiations carried out behind the closed doors with the Government acting as a go-for boy to this Big Brother. Its remit over the society was and remains huge – with powers to set wages, promotion and hiring policies, taxes and public spending and investment priorities. To all of this, our elected Parliament is an external observer with no power to change the course of the Partnership agreements. In effect, Ireland has long ago ceased to be a properly functioning democracy, where policies are set by the Parliament of the people for the people. This week events at the Joint Oireachtas Committee remind the entire world that our legislators can not question our public and corporate leaders even when their decisions and actions expose the Irish taxpayers to potential financial ruin. This is, by all means, an apt conclusion to the corporatist state saga of the Social Partnership – a neutered Parliament, a toothless democracy and a dysfunctional market short on international confidence. Thanks, Sean, for showing us the true state of this State. FT Deutschland reports that Germany's Finance Minister, Peer Steinbruck said that the euro area will find a way to 'circumvent the legal no-bailout clause'. Steinbruck was talking specifically about the potential need to rescue Ireland on the back of a dramatic increase in our CDS spreads - those pesky 'speculative' things that our DofF dismissed as being irrelevant minority instruments (see here). Oh, yes. Brian Cowen can start making the rounds - cap in hand. Just don't send that embarassment-in-a-Ministerial-Merc Mary to do the job, please, and don't tell Germans that we too share their fondness for a pint... We are no longer in a polite-visit-to-Japan territory. We are in a begging mood. Last night, the dollar rallied and the US Treasuries yeilds compressed on the back of a flight to safety, including the outflows from European bonds. Should Ireland tap into German funds for a rescue loan, Eurozone's golden standard German Bunds will suffer. If the rest of PIIGS were to follow Irish suit, there will be a wholesale downgrade in the Bund - a calamity for the Eurozone stability. So in the end, there is an argument that a rescue of Ireland might be forthcoming, if and only if that rescue is small enough - €2-3bn would work, €10bn probably won't. But of course Ireland's need for cash is nothing close to €2-3bn. Can Germany afford sacrificing its own bonds stability to plug Mr Cowen's budget deficit? Will Germany stand by and lend money to Ireland with no strings attached? Will German loans be better termed than those of the IMF? No one in the media has mentioned the turn of the phrase used by Steinbruck: that 'circumvent the legal no-bailout clause' thingy. 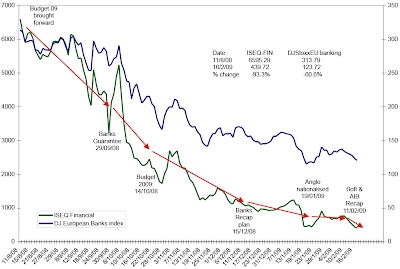 Even in better days of global growth, international markets did not look kindly on Eurozone's penchant for arbitrarilly re-writing its own rules of fiscla and monetary stability, as was done with the Maastricht criteria earlier this decade. Now, the appetite for reckless decisions is even lower. This presents a serious problem for the Euro - young currency's credibility is based on the rules underpinning its existence. Should these rules be 'circumvented', we may kiss good-by the idea of a stable Euro. Steinbruck's comments on Ireland did nothing to explain his view of the risks facing the Eurozone in the context of reckless Irish spending and economic management. This might be signaling that instead of economic stability concerns, Steinbruck was thinking about political issues. Will German rescue of Ireand come at the expense of forcing this country to ratify the Lisbon Treaty? Quite possibly so. Blackmail has been used by the EU before - most notably in the agreements with Norway and Switzerland and in the case of Nice Treaty vote in Ireland, as well as in the case of the Danish rejection of the Maastricht Treaty. Credit-default swaps (CDS) on Irish government bonds climbed to 386 today from 378.5... Irish swaps last week surged 95 basis points... Contracts linked to French, German, U.K and Spanish debt also rose to all-time highs. CDS, conceived to protect investors from default, pay the buyer face value in exchange for the underlying securities or the cash equivalent should a company fail to adhere to its debt agreements. An increase signals a deterioration in the perception of credit quality. Ireland’s Finance Ministry said it’s incorrect to draw conclusions about the “soundness of Ireland’s public finances” from credit-default swaps. no finance practitioners in fixed income with any reasonable senior private sector experience, and so on. In fact, the DofF can't even forecast its the figures under its own remit. Forget making markets pricing statements. But, hey, a good preemptive strike at the markets before things go further South is a way to go amongst Irish officials now days. And what a timely preemption this one was. 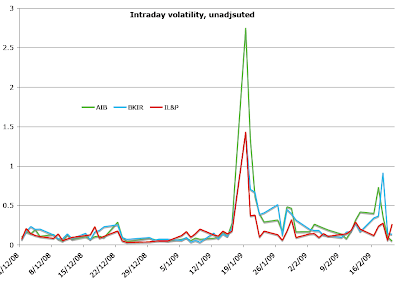 The latest figures from CDS markets for inter-trading period show: 390-405 spreads. As B. puts it, "we are 50% up in a week, and its only Tuesday!" And what about that ages-old deus ex machina of all incompetent polticians - the referencing to some "small number of market participants" keen on speculating in the financial markets. Surely we've seen them being proved wrong before... many times... hmmm, like with the EMU crisis. It is clear that our DofF boffins are simply too economically illterate to understand that no small handful of speculators can win absent real arbitrage opportunities. Thus, if the small numbers of such speculators still exist in the market, there is something true to their gambles. In other words, there is no smoke without a fire. Dough! Of course, it is not just the markets that are noticing Irish fairytale story of 12+% deficits and unbelievable DofF-cooked-up figures showing 3% deficit rule being met by 2013. Germans are noticing it too (see above mentioned Bloomberg report). And about time (see my comment to the WSJ blog here). What would Mrs Merkel have to say about the German taxpayers having to rescue our DofF from the clutches of the handful of market speculators? I am back in Dublin after a few days of snow-capped Italian Alps, great food, great wine, sunshine, crisp and clean mountains air. Friuli was, as it always is, a marvel! First, the recapitalization announced last week is not working. The magic, if a promise of the state taking a large chunk out of any future profitability, growth strategies and competitiveness of the Irish banks has had any magic in the first place, is now all gone. Gone because of the terms of this senile arrangement for all sides involved. (4) Businesses will stay away from this latest Government-engineered rip-off, while Ireland Inc's corporate and household balance sheets will still carry excessive levels of risk and debt and the economy will continue to spiral downward. So, Minister Lenihan, the scheme cannot work even in theory. Forget about trying to make it work in practice. (1) Some of those who made these comments themselves are keen on offering consultancy services advising foreign governments and commenting on their policies. Do their comments suggest that they claim a privilege to do what others should not be allowed? (2) A part of this debate has finally exposed the undemocratic, technocratic nature of some of the members of the Irish intellectual elite. One commentator went as far as state that any publicly open debate exposes Ireland to the irrationality of the masses and that openness and freedom of expression thus are best reserved exclusively for discussions involving only 'informed' policymakers and analysts. Which brings us to today's news: Irish 5-year CDS spreads have hit 378bps today, with a recovery rate of 40%, implying (assuming frictionless markets and no arbitrage) a lower bound of the Ireland Inc's default rate of 22%. Adding thinness of the markets (Irish bonds being traded in relatively small volumes, plus the half-day trading yesterday in the US) our implied sovereign default rate stands probably closer to 25%. These are the resignable-level figures for our Brian-Brian-Mary Triumvirate of the Incompetents. Prepare for carnage once the markets open tomorrow. Per latest RTE report (here), Irish Life & Permanent admitted that it provided 'exceptional support' to Anglo Irish Bank following the taxpayers-paid-for Government [banks] Guarantee Scheme. According to IL&P at the times of 'unprecedented turmoil' there was 'an acceptance that financial institutions would seek to provide each other with appropriate support where possible'. It is claimed that the transactions were fully and appropriately accounted for in the books and in regular reports to the Financial Regulator. Anyone still surprised that the global markets are treating Irish equities as some sort of the corporate governance lepers? Any surprise that some institutional investors are no longer willing to hold any shares in the cozy cartel of 'supporters' that is Ireland Inc? 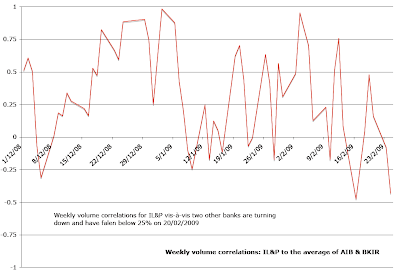 Can these actions by IL&P be interpreted as a deliberate manipulation of the market? Corporate deposits are the components of bank's balance sheet that support share price valuations. Interbank loans - a normal procedure - are not. If deposits were made to provide 'support' to the Anglo, without an immediate publication of these deposits and their underlying causes to the markets, did IL&P and Anglo collude to alter the bank's balance sheet without revelation of this price-sensitive information? Did IL&P deposits undermine own balance sheet and were they properly cleared through the risk-assessment process? Was IL&P shareholder value safeguarded in the process of making this gesture of camaraderie? If IL&P did disclose such deposits to the Financial Regulator, why these deposits were allowed to proceed and why this information was not made public immediately? If the FR knew about the covert nature of deposits, were they de facto a party to concealment of a price-sensitive information? We are all aware of the rumors that both the Guarantee Scheme and the Anglo's nationalization were carried out due to some critical events involving the Anglo and (in the case of the Guarantee) some other banks. 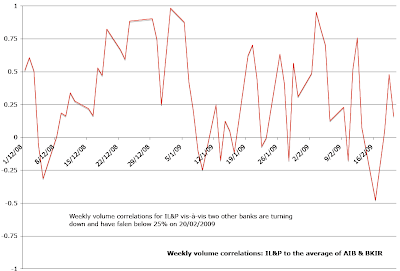 Withdrawals of corporate deposits on a massive scale were rumored in late September and December 2008. Why is the Government unwilling to disclose the nature, the extent and the timing of these problems? After all, the Government is (largely rightly, I believe) using taxpayers money to shore up our financial system, committing tens of billions of our own and our children's funds to underpin the Guarantee, the nationalization and the bailouts. At an even deeper level: has there been an implicit (hear-no-evil, see-no-evil) or explicit (via refusal by the Government to admit the nature and extent of the triggers for emergency measures) collusion between the Government and the banking sector to sweep under the rug the problems of governance and management at some of our financial institutions? Not a single revelation about the mis-conduct events associated with the Anglo has been made public by the Government in a voluntary fashion. Not a single piece of information concerning the due diligence process in re-capitalisation decisions by the State has been made public by the Government. In light of this it is legitimate to ask questions of the Government as to the nature of the silence that shrowds the taxpayers' bailout of the banaking sector. Over recent days there has been a lot of talk in the international finance circles about the skeletons hidden in the closets of Irish banks. Reputational capital of Ireland Inc is no longer running thin - it is, by now, about as hole-ridden as a slice of Swiss cheese! Public safeguards that were entrusted to enforce this market-supporting law might have comprehensively failed. If this is the case, it is time for heads to roll. Now! Starting at the top of the Financial Regulator's office and right through to the companies involved. And as per re-capitalization scheme, any injection of public money must be preceded by a comprehensive independent (internationally-administered) review of the banks' balance sheets and books, prior to any State-financed repairs can be made. "Spreads of sovereign debt within the eurozone have increased dramatically during the last few months, largely as a result of panic in the financial markets. When it engages in quantitative easing, the ECB should privilege the buying of Irish, Greek, Spanish and Italian government bonds to eliminate the distortions and the externalities that these spreads create,"
says Paul De Grauwe in his yesterday's post on Vox - a worthy reading. What this means is that, as predicted in my earlier posts, Ireland is now a prime candidate for an ECB-led rescue. De facto, De Grauwe's proposition implies Irish Government issuing (near-)worthless bonds and placing these with ECB in return for loans - a scenario that is indistinguisheable from an actual lender-of-last-resort rescue or equivalent to IMF lending money to Ukraine, Latvia, Hungary and Iceland. "My hypothesis is that the widening bond spreads within the eurozone are the result of panic in the financial markets. The panic that followed the banking crises has led investors into a stampede away from private debt into assets that are deemed safe. These are mainly government bonds of a few countries. The US, Germany, and possibly France are a few of these countries that, for some strange reason, have been singled out as supplying safety. Other countries do not profit from the same 'panic flight to safety'." "Only Greece and Ireland saw their bond rates increase significantly over the last year, suggesting that the increased spreads of these countries are not only due to panic." Needless to say - I agree with De Grauwe. Irish (and PIIGS in general) spreads are fundamentally linked not to those of the other Eurozone states but to the lack of national competitiveness (see De Grauwe's chart on unit labour costs reproduced below), economic diversification, cumulative wealth of society, infrastructural and human capital and indeed many other economic fundamentals which determine the resilience of economy in a downturn. In short - not a panic, but a low productivity of the PIIGS economies drives the crisis. In short, our econocrats, so keen on pumping public sector investment into building up Ireland's capital base, infrastructure, education etc somehow managed to convince themselves that our deficit in these areas, alongside our vast and widening Exchequer shortfall, uncontrollable public spending growth, massive banks guarantees and recapitalization commitments by the state and macroeconomic management that requires raising taxes during a severe recession, all matter little to the bonds markets. Instead, the panic - that deus ex machina of economics - is the answer. 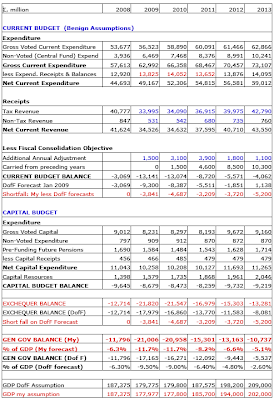 As promised - here are two scenarios estimating the state of the nation's finances. The tables are based on DofF Update January 2009. Benign scenario assumes moderately deeper growth contraction (GDP), a fall-off in the tax receipts (as outlined in my previous update - in line with January 2009 Exchequer returns), a contraction in semi-state companies returns and my forecast for the 'savings' to be achieved in 2009-2013. All changes are marked in red. Blue color denotes differences in assumptions between moderate and benign scenarios, with moderate scenario assuming slightly deeper contractions in tax revenue, semi-states returns and shortfall in committed 'savings'. Perhaps the most important lines to consider in both scenarios are lines: GEN GOV BALANCE and Gen Gov balance as % of GDP, which show that even under benign scenario, current dynamics in tax receipts and semi-states' revenue imply that Ireland will not be able to achieve Growth and Stability Pact limits on Governement deficit of 3% by 2013. 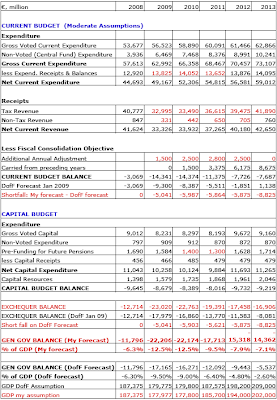 The range for Gen Gov Balance Deficit is between €21bn and €22bn in 2009 - a far cry from the DofF forecast of €17.2bn. the cuts that will have a cumulative effect over the years forward are not going to cover the entire amounts planned, so that one-off-measures will play a significant role in total savings to be achieved. 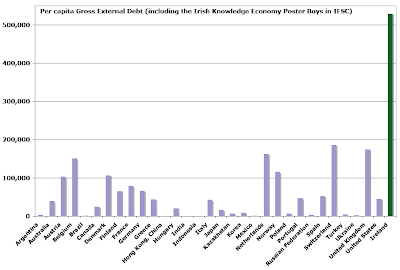 Chart 1 shows the most indebted (in absolute terms - gross external debt volumes) nations of this world with their debts expressed as percentage of Ireland's gross external debt. This clearly ranks Ireland as the 9th most indebted nation in the world, and 6th in the Eurozone. 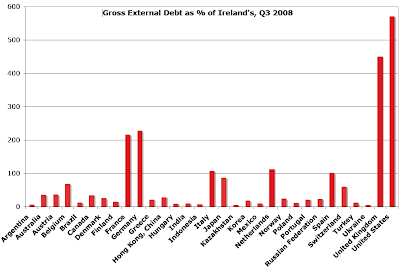 Note that in absolute terms, Irish total debt is greater than that of Japan! Now, Chart 2 is even more revealing, as it plots per capita debt levels of the most indebted (in absolute terms) countries in the world. Ireland is a clear outlier! Massive, unpredictable and a (possible) danger to others... Is there something moving in the corner? An anonymous reader asked in a comment to the previous post if I can provide any solutions to the problems we currently face in Irish economy. DofF projected budgeted expenditure to be in the region of €49bn and receipts in the region of €37.7bn. I forecast, based on the latest Exchequer results the latter to be no more than €33.6bn. My figures now imply (assuming that the €2bn savings factored in by DofF in January and announced this week will yield real savings of €1bn) a General Gov Balance of €23bn (or 12.1% of GDP) up from €17.98bn (or 9.5% of GDP) allowed for by DofF. Note - yes, you've read it right - GGB of €23bn for 2009! cut by 17% net current expenditure - savings ca €8.3bn in 2009. 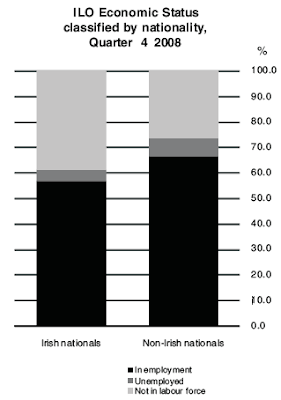 To achieve the latter savings, I would suspend up to 75% of the overseas assistance, cut by 75% pre-funding for future pensions liabilities, roll back all public sector pensions indexation to 2006 level, carry out significant cuts in non-front-line personnel in health and education, public service and semi-state companies, and cut welfare payments by approximately 5%. I would also move to privatise the remaining public assets, etc. Some of the cuts can come through a direct increase in the efficiency of public sector operations. For example, we can use existent IT and university facilities to increase the number of students attending each class, accommodating those who become unemployed and wish to pursue educational opportunities. This will save significant amounts on the Continued Education grants. 1) Banks: I would use recapitalisation scheme to inject equity (stock options) into households' savings and draw down household debt - I've outlined such a scheme before. The real stimulative benefit of the planned €10bn recapitalization scheme will be (assuming 15% appreciation in banks shares to 2013 and a one-off 40% CGT on options at maturity) ca €2.2bn pa through 2013. Draw-downs in HHs debt (at 50cents per €1) will imply additional benefit of €1bn pa.
2) Taxation: I would finance through a surplus savings of ca €2bn on the expenditure side (see bullet points above) a tax cut in employer PRSI and expand investment tax credits for labour-intensive investments. I will also freeze local authorities charge and levies, review regulated price controls (energy, gas, water, public transport etc). 2) Property/Land Value Tax: to finance local authorities I would impose a land value tax to be computed on the value and size of the plot occupied by your dwelling. The tax will be phased in allowing for those who have paid stamp duty in recent years to obtain credit against the tax value. Stamp duty tax will be abolished. 3) Flat income tax: on all income, including corporate profits - to be set at a revenue-neutral rate (suggesting, for example a tax of ca 16% flat on all income in 2008 terms). I provided details of calculations and complexities involved in computing this tax years ago, but the core idea remains. If this implies raising our corporate tax a notch - so be it. There is absolutely no economic or moral reason as to why physical capital should be taxed at a different rate from human capital. 4) Balanced Budget & State Property Amendments: pass a constitutional amendment to ensure that the real growth in Government expenditure cannot exceed at any year (with exception of the national emergencies, of course) the real rate of growth in GNP less 1%. Pass a constitutional amendment barring the State from ever holding a stake (except in the cases of emergency, subject to a 2/3 majority vote in the Dail) in any commercial enterprise. 6) Anti-monopoly laws: I will strengthen the Competition Authority to reflect the powers of competition enforcing bodies in the UK and will require that no company in any sector be allowed to control more than 30% of the market share. Sorry, guys & gals - we are in 1am territory and I have a busy day ahead. I will return to this topic in the future posts, but for now a call to arms - send me your ideas for reforms!